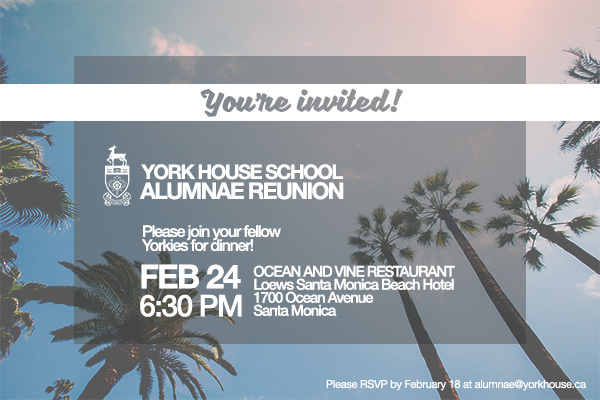 On visiting the YHS Museum & Archives, alumnae travelled back to their time at York House through the many exhibits of past uniforms, the original old houses where their classes were held, and class reunion photo boards prepared by archivist and curator, Susannah Smith. The tour culminated with the unveiling of a new museum display case in the Gail Ruddy Foyer. This most thoughtful gift from Margaret (Shepard) Walwyn ’55, celebrates three generations of proud Yorkies including her daughter, Head Girl and past YHS Foundation Chair Catharine (Walwyn) Turner ’84, and granddaughters Megan (Class of 2015) and Claire (Class of 2017). The family recognition plaque reads “Always a Yorkie” and now treasures from the archives can be brought out for display to share YHS history and traditions with the whole community. Lisa (Greczmiel) Roberts ’82, President of the Alumnae Association presented Helen (Larmonth) Hughes ’50 with the 2016 Alumnae Lifetime Achiever award. Helen was nominated by her class and is the first recipient of this new Association award. Although officially retired after 18 years serving on the Victoria City Council, Helen continues to volunteer and still follows the school motto “Not for ourselves alone.” She has received numerous accolades throughout her life for her community service including the Order of Canada, YHS Alumnae Special Achiever for Community Service, honorary degrees from the Universities of Saskatchewan and Victoria, the Chancellor’s Community Recognition Award from Royal Rhodes, the Maclean Award for Outstanding Service by a Woman in Municipal Politics, a Lifetime Achievement Award from Leadership Victoria, a Generosity of Spirit Award sponsored by the Victoria Foundation, a Queen Elizabeth II Diamond Jubilee Medal among others. 50th, 60th, and 70th pins were presented and class reps and volunteers were recognized for their work in bringing their classes together and organizing class reunion gifts. The class celebrating 50 designated the Alumnae Scholarship and the class celebrating 60, the Founders Scholarship. The luncheon came to a close with the precious delivery of green and gold wrapped Yorkie chocolates by Grade 1 and 2 students. 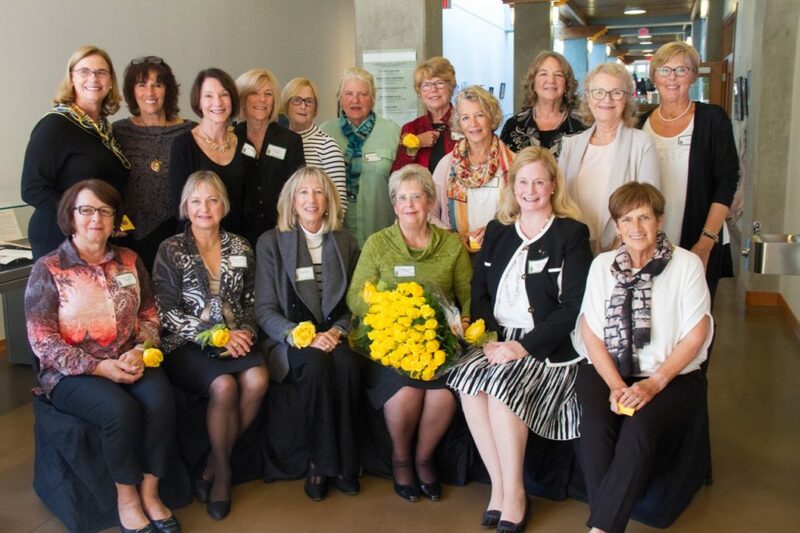 Click here to see all the photos from the Golden Alumnae Luncheon.